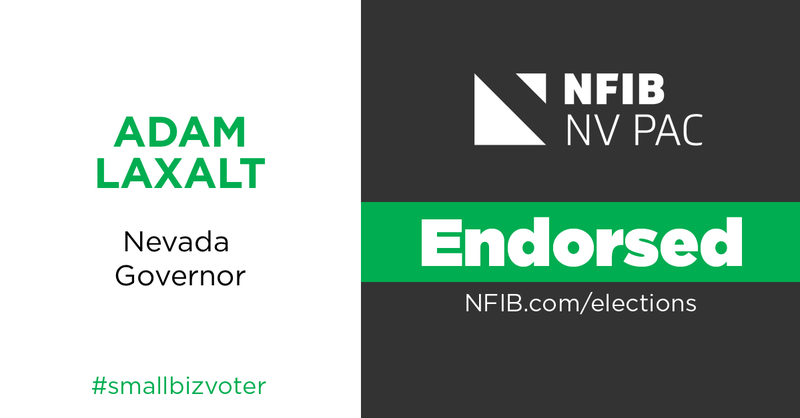 CARSON CITY, Nev., Sept. 5, 2018—The political action committee of Nevada’s leading small-business association today announced its endorsement of Adam Laxalt for governor. Thompson listed Laxalt’s work for Main Street enterprises. He led a coalition of 21 states challenging the U.S. Department of Labor’s, Obama-era overtime rule. In 2015, he filed suit on behalf of Nevada challenging the federal Waters of the United States rule, joining a bipartisan coalition of 13 states suing to invalidate the rule. He and five other state attorneys general sent a letter to the chairman of the National Labor Relations Board (NLRB) opposing the agency’s redefinition of the decades-old legal standard for joint-employer status. He helped curb abusive litigation practices related to the ADA that had been taking advantage of small businesses. Laxalt’s opponent, Steve Sisolak, did not return the NFIB Nevada PAC questionnaire. Follow NFIB Nevada on Twitter @NFIB_NV.